Villa Monplaisir is in the Bearn region of South West France. It is a wonderful area for tourists with such a variety of interesting things to do it would be impossible to describe them all in one website. A few idea have been listed below just to give you a flavour of this historic and delightful area. Biarritz has great beaches such as La Grande Plage with its distinctive striped bathing tents. Or drive up the coast to Anglet or Hossegor for some of the best surf in the world. It is also possible to take surfing lessons. 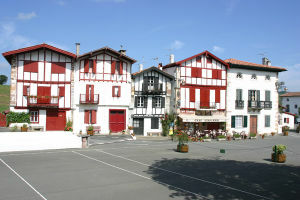 Bayonne is the centre of the French Basque region. It has a distinctly Basque feel to it, with its whitewashed houses and red or green shutters. The cathedral is worth a visit, and so is the Musee Basque at 37 quai des Corsaires, which is dedicated to the history of the Basque people and culture. St John de Luz, is another delightful resort with a distinctive Basque identity. It is an active port with a natural harbour, which also protects the beach, making it one of the safest and most enjoyable areas for bathing along the Atlantic coast. The Place Louis XIV near the harbour is pretty, with local artists showing their work and the Eglise St Jean Baptiste on Rue Gambetta is a fabulous Basque church where Louis XIV married Marie Therese of Spain. 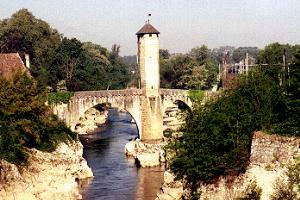 Orthez is one of the closest towns to Salies de Bearn. It is a medieval market town built around the old bridge, Pont Vieux, which was an important crossing point for pilgrims en route to St Jacques de Compostella. There is an excellent market on Tuesdays. Pau has an interesting Protestant past, and its ruler Jeanne d'Albret was involved in the Wars of Religion with Catholic Spain. She gave birth to King Henry IV who had to switch faiths in order to become King. It is an elegant town, that has always been a favourite with English tourists and it is a good starting point for trips into the Parc National des Pyrenees.